Ama Dablam. Normal route to climb Ama Dablam is South- West ridge. It is Golden Mountain for new mountaineers who starting climb to high Himalayas in Nepal. Ama Dablam 6812m. A small snowcapped peak of 6812m lying in the Everest region. Manaslu (8156m) was first climbed in 1956 by a Japanese expedition. Its name comes from the Sanskrit word manasa, meaning "intellect" or " soul" It is the same root word as that for Manasarover, the holy lake near Mt. Kailash in Tibet. Mount Annapurna is an enormous Himalayan massif, the tenth highest mountain in the world. In 1950, it became the first 8,000 meter mountain to be successfully climbed. It is located east of a great gorge cut through the Himalaya by the Kali Gandaki river. Annapurna is a Sanskrit word which when broken down, would mean, "Sustenance" and "filled with". So the name would translate into "The Goddess rich in Sustenance" or simply "The Provider". It was first climbed by M. Herzog & L. Lachenal in 1950. Nepal - An ascent on Baruntse (23,390ft / 7,129m) is an adventure for climbers wishing to summit a true Nepali peak. This remote expedition into the heart of the Khumbu culminates in a relatively short climb to the summit of this majestic 7,000er. 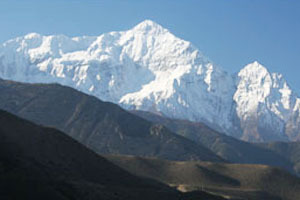 Kanchanjunga, at 8598m, is the third-highest peak in the world and the second-highest in Nepal. It was first climbed by a British team in 1956. 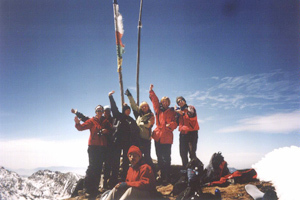 The peak consists of four summits. The west summit, Yalung Kang, is 8420m high and some people classify it as a separate 8000m. P.
Lhotse (8516) was climbed by a Swiss expedition in 1956. Its lower peak, Lhotse Shar, 8383m, sometimes considered a separate 8000m peak, Lhotse, which means "South peak" is part of the Everest massif, just to the south of Everest. Shishapangma is one of the very lovely mountain of China, which lies in the autonomous region called the Tibet of China, only a very few people in the world had idea about the Shishapangma before the Chinese opened Tibet to the western summiteers in 1978.